Good call on both counts, thanks! The double track at Harwich Town looks like a mistake -- I missed that the line becomes single after Harwich International. As for St Albans, I typically add reversing sidings when I start implementing services and (upon looking at the OpenTrainTimes timetables) realise that vehicles won't be able to simply reverse in the platforms. Thameslink is coming relatively soon, right after I've filled out more of the Kent services, so that will be added soon. Glad you're finding the videos interesting! it's quite amazing looking at the bigger picture. Thanks both. I'll be sure to make a video of the GWML when the time comes! I see you are running the newest version? Perhaps you would post a save & pak? Please note that Experimental will occupy 1.5GB of RAM when this savegame is open! On this note, I should say that once this is finished I plan to release a set of "GB trains" addons for pak64, since the work will have been done anyway. 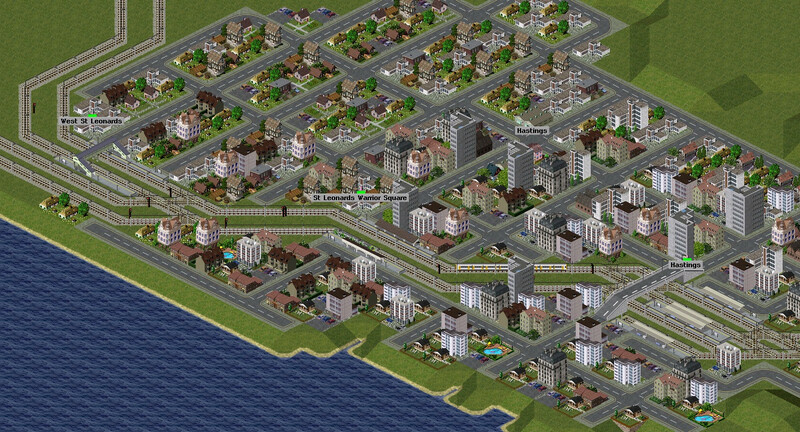 Edit: If you downloaded this you may have noticed the Shenfield Bug; I've fixed this now. Have you make new modells for Simutrans exp? Yes, there are lots of new vehicles in that download -- and when the time comes I will release them as a set for Standard as well as for Experimental. Another video? Why not! This time we take a Tour of Kent and South-East London, a section of the map which is now finished! Ashford International, where the highspeed lines from St Pancras join the regular lines. 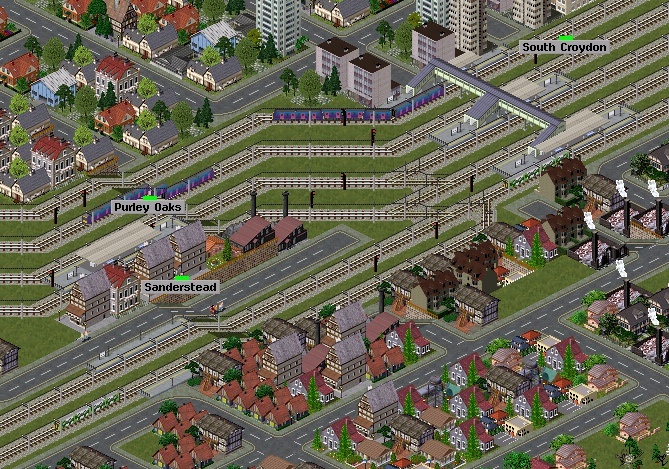 Just east of Bromley in SE London, the mainline from Victoria crosses another mainline from London Bridge. We see a mixture of fast and slow services. I became a member on the fourms due to the fact that you started doing the youtube Vids. I would like to thank you for making such an awsome map as I don't need to look at any of the Rail maps anymore! But anyway, could you post an updated version of your map? I've seen it change from the last verison you posted in your most recent video. I am absolutely astounded by the sheer scale and accuracy with this project. Props to you for this. 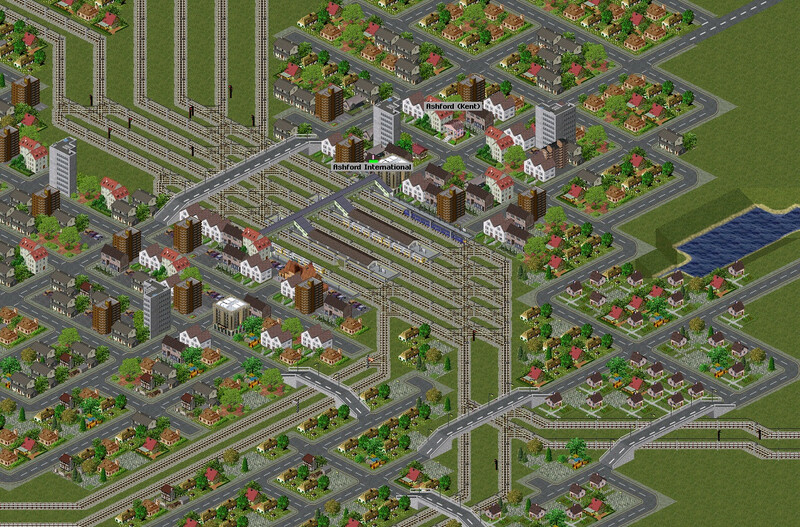 The computer I'm using at the moment has less RAM than a sheep farm following a foot and mouth outbreak, so I can't load the savegame up myself; so I was wondering if you wouldn't mind posting screenshots of the Hastings and Milton Keynes Central stations. treiskin: I will upload a new savegame very soon. Thanks Carl, looking forward to seeing whats diffrent from the 2nd version! The most notable addition, on top of the Kent lines, is the complete Thameslink network: Bedford-Brighton, Luton/St Albans-Sutton/Wimbledon, and Kentish Town-Sevenoaks. Here's a shot of two Bedford-Brighton services passing at South Croydon, whilst a train to East Grinstead can be seen in the bottom left. The Southern-liveried train is the Ashford to Brighton service, and the Southeastern train is running from Charing Cross to Hastings. This is about 17 minutes past the hour, when the two services past just outside St Leonards Warrior Square. IRL there are tunnels either side of St Leonards Warrior Square, but it wasn't possible to include them here. Beautiful screenshots of an impressive map! Your network is amazing and seems very clear and structured! It's a pleasure to watch yours clips too I'm thinking about doing my owns clips of my map too. Good game! I've been somewhat preoccupied for the last month or two, so progress has slowed down on this map. But now I'm back on the case! New video content will be coming soon. Lewes is an important junction in East Sussex -- trains leave to Brighton, London Victoria, Seaford, Eastbourne and Ashford International, among other destinations. All trains at the station are operated by Southern trains. Hi Carl! 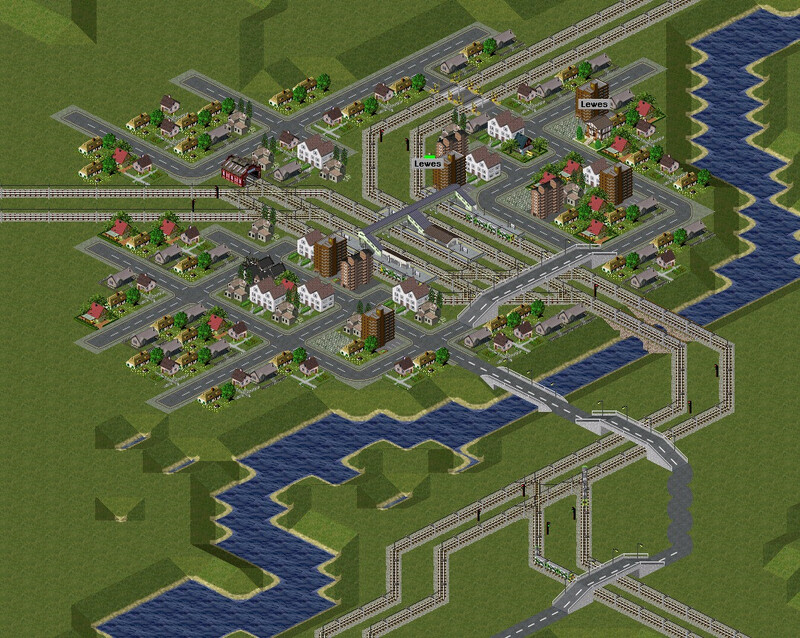 Your rail lines, are clean and nice, and stations organized. I like it. I shall be interested to see that! The Photo looks good out. Thank you! And good call on the signature - I forgot all about that. I would love to see it myself so could you put a updated map/pak download please? That is beautiful, and it makes profit! I always though 256 was about the limit of map size my PC could take, so it's interesting to see that it can do 200 times that (or at least 10 times at very high density). Also explains why I couldn't match a consistent scale (which I kind of knew but didn't really understand). 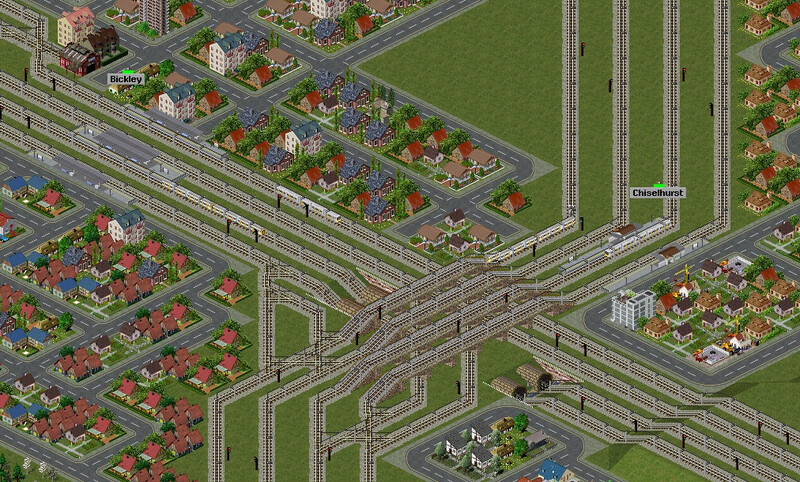 I haven't played the savegame but I watched all your videos (great work, by the way) and I have a question: in the video about schedules, you showed that you use a single Simutrans line to cover multiple real life services. How does that affect passengers routing? I mean, if you have a line [(city A station1 -> B -> C -> B -> As1) -> (As2 -> D -> E, etc)], how do you prevent passengers boarding, say, C and staying on the train all the way to D or transfers from another line at As2 for B, which obviously are not the desired behaviours? Passengers are a bit clever, they always choose the shortest mean to go the their desirate destination. For your example, the passenger will wait the second passage of the train in the C station to go to the D station. Does it answer to your question? Thank you for the new rarfile. It's be plan to update the png and dat files from those rarfile? That's not what I ment. A1-B-C and A2-D-E are supposed to be different services; even if in real life they are operated by the same trains like in Carl's simulation, passengers won't consider that a single line and/or direct route, and won't be allowed to stay on board during the tecnical transfer between A1 and A2. A realistic passenger trip would be to take the first line to A1, use whater form of urban transit is available (or walk, since in Experimental there's this option) to go from A1 to A2, then board the second line to D.
Also, passengers to B or C are supposed to reach A1 to start their journey, instead (given my experience with Simutrans) in this configuration they could choose A2 or any other station of the second service as a valid starting point for a trip without transfers, while in real life that's definetly not the case. I'm asking if Carl has a way to force passengers to make the proper journeys, since the simulation of the real network is the focus of the map, or if he just didn't care because that wasn't what he wanted to achieve. In the first case, I'd really love to know how he does it because it would be really handy for other games. Good questions. The short answer is that passengers are typically clever enough to avoid the kind of situations you describe, and this requires very little intervention on my part. The simulation of passengers' journey selection is detailed enough to avoid those situations for the most part. Passengers are of course "allowed" to stay on the train between C and D in your example. But they rarely will, because this will rarely be the fastest route between C and D. In Experimental there is no preference for a direct route over a route that involves changing trains -- the latter will always be preferred if it is faster. Sometimes it takes a little while for them to figure this out -- for a month or two the passenger flows on these lines can be somewhat odd. But strange passenger journies like you describe happen quite rarely. Simulation of passenger flows is definitely one of the goals of this map (if not the main goal), and typically it's something that "just happens" rather than needing much specific intervention on my part.